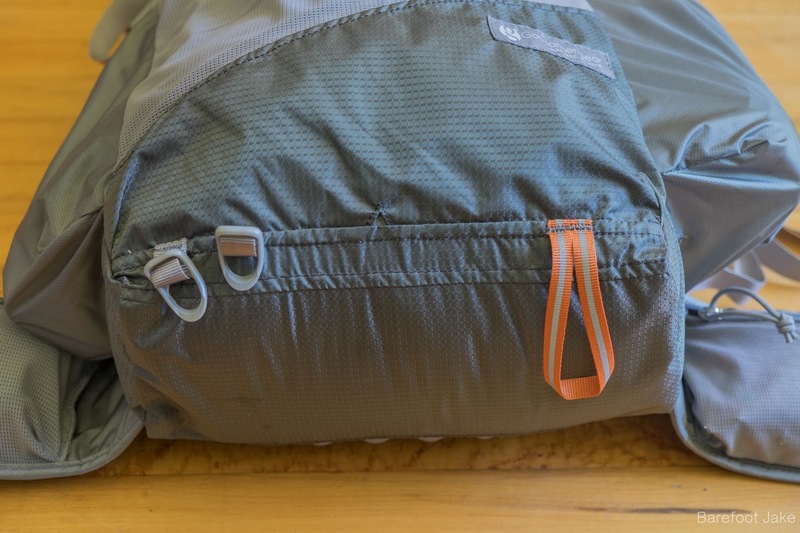 Lets take a look at the Pilgrim Roll Top Backpack. 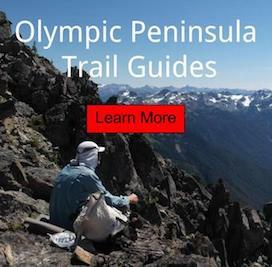 This newest addition from GG caters to the minimalist hiker. The new pack includes a frameless design, fixed hipbelt and roll top closure. 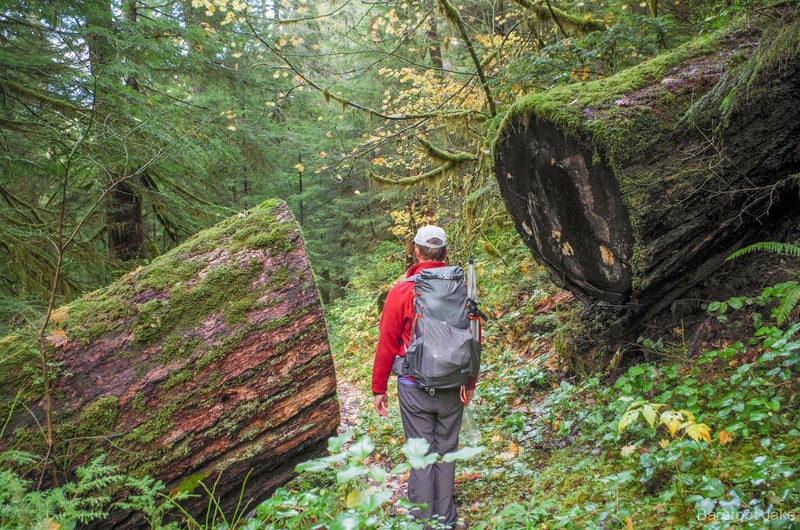 Sizing hits the sweet spot for a weekend ultralight backpacking trip in the summer months. I really like the sleek design of a roll top closure, and the fixed hipbelt gives the whole pack a stable and secure feel while its riding on your back. As you can see, the pack body has a very streamlined appearance and does not include a lot of unnecessary webbing or fabric; which leaves out dead weight. The major difference I see over other backpacks, is how the weight sits close to the frame of my body. The Pilgrim has less depth in the main compartment. During my testing I saw that this makes the weight sit more naturally on my hips with heavy loads. Keep in mind, despite of being a roll top backpack, this pack is anything but water tight or resistant. Make sure to keep everything in the main compartment in a secondary water prevention methods. The roll top closure is a simple way to secure your load and not have to fuss with cord locks or pack lids. You can fill up the backpack as much or little as you want and then you roll it down tight and snap it in with the two side buckles. At full capacity you can leave it unrolled and snap the buckles together. For extreme cases where you will want to pack more gear or possibly a bear canister sticking out the top you could just fill it to the brim and then secure it with a cord. You can surprisingly fit a ton into this little guy. 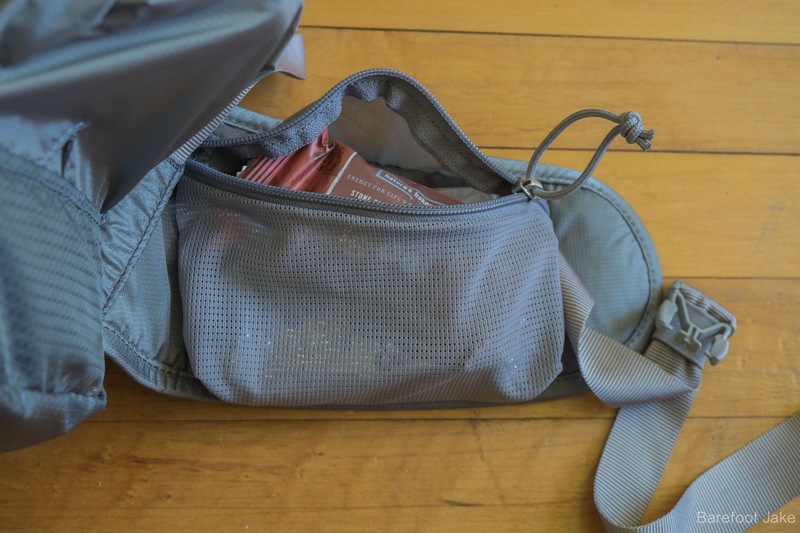 Also included are two functional side pockets on either side. I use them for easy access my hydration system, snacks, and items I may need throughout the day. These pockets are slightly deeper than previous models (Kumo, Gorilla, and Mariposa Packs) making for a secure hold so I don't have to worry about my water bottle falling out and rolling down the mountain while scrambling up steep terrain. 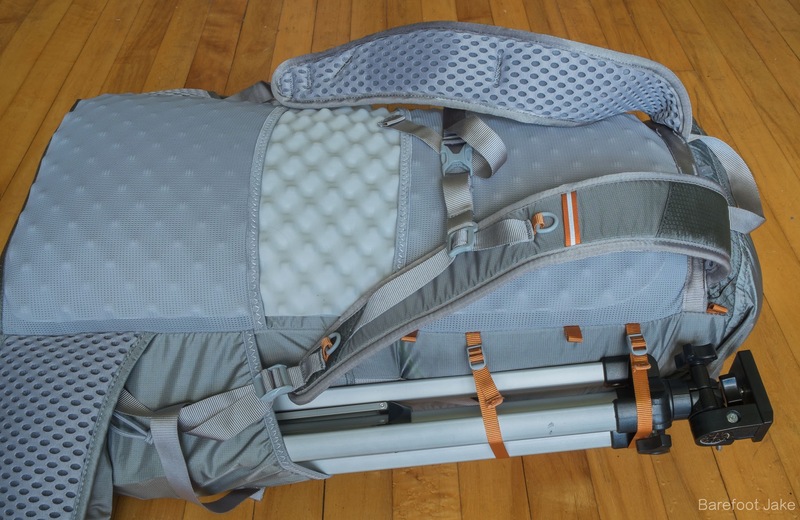 In conjunction with the side compression straps I can securely store longer items such as hiking umbrella, trekking poles, camera equipment (like a tripod), and tent poles. In the above picture you can see the large, grey external mesh pocket which is strong, breathable, and very stretchy. I can throw my giant camera, food, cooking system, wet tent fly, and extra clothes layers all in there no problem. I find this a very necessary accessory now to have on ALL of my backpacks. Once I discovered the convenience of being able to see my items through the mesh, its large holding capabilities, and ease of access for pulling things in and out repeatedly through the day-- there's no way I'm ever using a different type of system. These wider shoulder straps help the weight sit evenly on my chest. The 3D mesh on the inside provides a layer of soft cushioning and channels air across the skin and wicks moisture away for max breathability and temp control. There is also a small hydration pack webbing on both straps leaving you the option to affix your hydration tube to either side. Or go crazy and put two. Double fist it "hiker style"- one with water and the other with chocolate milk. This fixed hipbelt keeps the pack really secure and stable to your body. I noticed that it carries weight more efficiently. What I mean by that is that it puts the majority of weight on your hips rather than pushing or pulling all the weight onto your shoulders. As I mentioned before the 3D mesh also provides a soft cushion and keeps you cool during hot hikes. 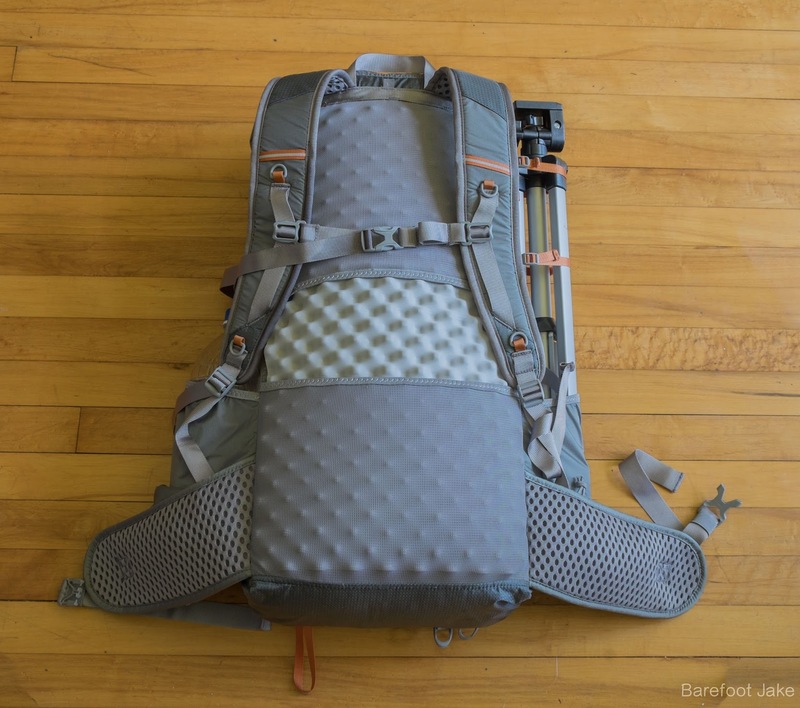 The Gossamer Gear Pilgrim Roll Top Backpack fits the bill for any minimalist hiker looking to complete his ultralight set up and take on weekend warrior backpacking trips without the extra weight. Unlike typical mainstream backpacks that you see in most stores, there is nothing on this backpack that doesn't have a function or purpose. 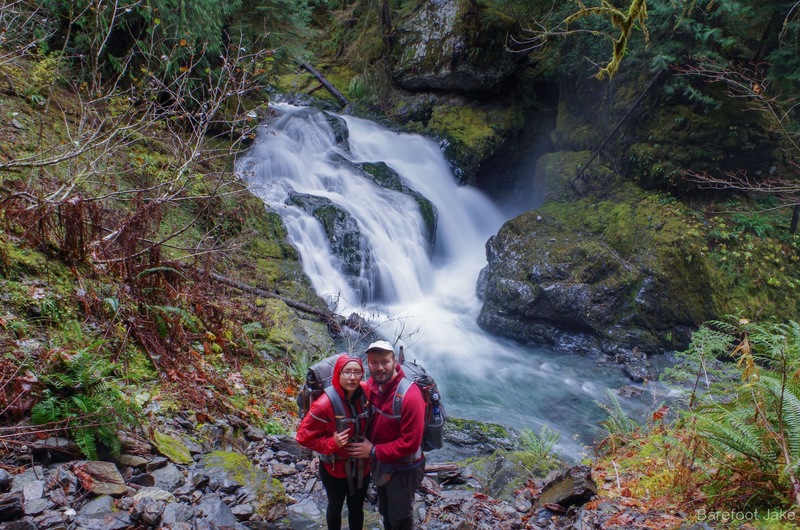 Gossamer Gear makes sure to keep the hiker in mind for everything on this pack- nothing makes for a better trip than keeping my bag light and having easy access. The fixed hipbelt and shoulder straps only do so much to keep your load stable and secure- always make sure you are packing your bag properly! 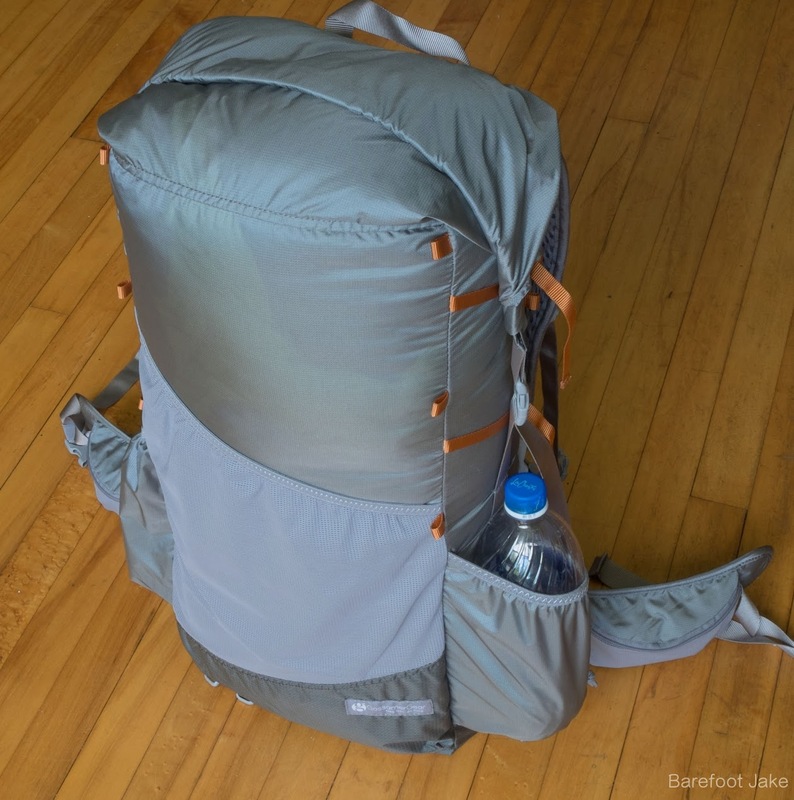 Product update: The powers that be at Gossamer Gear have discontinued this backpack. You can now get them at a discount. Disclaimer: This pack was free of charge, in exchange for this article.